For Research Use Only in the United States. Not for use in diagnostic procedures. 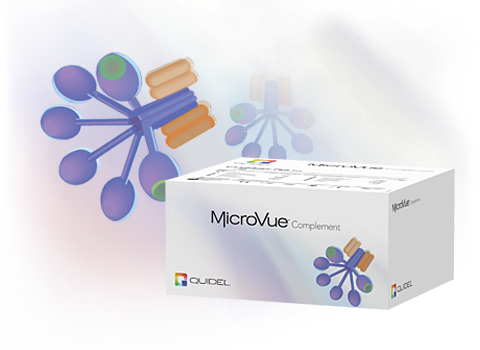 The MicroVue Ba EIA measures the amount of Ba present in human urine, serum, plasma and other biological or experimental samples. The alternative complement pathway provides innate protection against microbial agents in the absence of specific antibody. The activation of this complement pathway can be triggered by a variety of substances including microbial polysaccharides or lipids, gram-negative bacterial lipopolysaccharides, and surface determinants present on some viruses, parasites, virally infected mammalian cells, and cancer cells. In autoimmune diseases, the alternative complement pathway may contribute directly to tissue damage. A centrally important reaction that occurs during alternative pathway activation is the conversion of the 93 Kd molecular weight Factor B zymogen to an active proteolytic enzyme. This is accomplished in a two-step reaction. During the first reaction step the Factor B forms a magnesium-dependent complex with C3(H20) or C3b. The C3(H20),B complex is formed only in fluid-phase while the C3b,B complex can be formed either in fluid-phase or on a target surface. Factor B, which is present in the C3(H20),B or the C3b,B complex, is cleaved into the Ba (33 Kd) and Bb (60 Kd) fragments in the second reaction step by the alternative pathway enzyme, Factor D.
The MicroVue Ba Enzyme Immunoassay measures the concentration of Ba in human urine, plasma, serum and other experimental samples. It uses a proprietary monoclonal antibody that binds specifically to Ba to capture Ba in solid phase. The trapped Ba is then detected by HRP-labeled antibodies to Ba antigens. This test provides a quantitative measurement of Ba levels and is designed for investigations into the role and status of alternative complement pathway activation in numerous clinical and research settings. Wang K.C, Lewis W.H.P, Leung P.C., Chien P. Hung L.K. A longitudinal study of C3, C3d and factor Ba in burn patients in Hong Kong. Burns 24(3): 241-44, 1998. Sundsmo J., Chin J., Papin R., Fair D., Werb Z. Factor B, the complement alternative pathway serine proteinase, is a major constitutive protein synthesized and secreted by resident and elicited mouse macrophages. J. Exp. Med, 161: 306-22, 1985. Ueda A., Kearney J., Roux K., Volanakis J. Probing functional sites on complement protein B with monoclonal antibodies. J. Immunology, 138 (4) 1143-49, 1986. Ambrus J., Peters M., Fauci A., Brown E. The Ba fragment of complement factor B inhibits human B lymphocyte proliferation. J. Immunology 144(5) 1549-53, 1990. Schreiber, R.D. and Müller-Eberhard, H.J. New developments in the activation of the alternative pathway of complement. in Immunoassays: Clinical Laboratory Techniques for the 1980's. Alan R. Liss, Inc., New York. p.411, 1980. Gotze, O. and Müller-Eberhard, H.J. The alternative pathway of complement activation. Adv. Immunol. 24:1, 1976. Fearon, D.T. and Austen, K.F. Current concepts in immunology: the alternative pathway of complement — a system for host resistance to microbial infection. New Engl. J. Med. 303: 259, 1980. Pangburn, M.K. and Müller-Eberhard, H.J. The alternative pathway of complement. Springer Semin Immunopathol 7:163, 1984. Ratnoff, W.E., Fearon, D.T., and Austen, K.F. The role of antibody in the activation of the alternative complement pathway. Springer Semin Immunopathol, 6:361, 1983. Hugli, T.E. Biochemistry and biology of anaphylatoxins. Complement 3:111, 1986. Fearon, D.T. and Austen, K.F. Activation of the alternative complement pathway due to resistance of zymosan-bound amplification convertase to endogenous regulatory mechanisms. Proc. Natl. Acad. Sci. (USA) 74:1 1683, 1977. Fearon, D.T. Regulation of the amplification C3 convertase of human complement by an inhibitory protein isolated from human erythrocyte membrane. Proc. Natl. Acad. Sci. (USA) 76: 5867, 1979. Fishelson, Z. and Müller-Eberhard, H.J. Residual hemolytic and proteolytic activity expressed by Bb after decay-dissociation of C3b, Bb. J. Immunol. 132:1425, 1984. Gotze, O., Bianco, C. and Cohn, Z.A. The induction of macrophage spreading by Factor B of the properdin system. J. Exe. Med. 149:372, 1979. Kolb,W.P., Morrow, P.R. and Tamerius, J.D. Ba and Bb Fragments of Factor B activation: Fragment production, biological activities, neoepitope expression and quantitation in clinical samples. Complement and Inflammation 6:175, 1989. Sefton, M.V., et al. Using ELISA to evaluate complement activation by reference biomaterials, J. Mat. Sci 5:622-627, 1994. Mold, C. Tamerius, J.D., et al. Complement activation during painful crisis in sickle cell anemia, Clinical Immunology and Immunpathology 70:3,314-320, 1995. Buyon J, Tamerius J. et al. Assessment of Disease activity and impending flare in patients with systemic lupus erythematosis, Arthritis and Rheumatism 35(9) 1028-1036, 1992. Oppermann M., Kurts C., Zierz R., Quentin E., Weber M., and Gotze O. Elevated plasma levels of the immunosuppressive complement fragment Ba in renal failure, Intl. Soc Nephrology (40) 939-47, 1991. Pryzdial E., Isenman D. Alternative complement pathway activation fragment Ba binds to C3b. JBC 262 (4) 1519-25, 1987. Buyon J., Tamerius J., Ordorcia S., Young B., Abramson S. Activation of the alternative complement pathway accompanies disease flares in systemic lupus erythematosus during pregnancy. Arthritis and Rheumatism 35(1) 56-61, 1992.